I know that a Francophile is someone who loves all things French, but what do you call someone who is obsessed with France, or at least French inspired clothing? That would be me, and I guess also one of the sales associates who helped me in the dressing room at J. Crew because she told me she loved anything French inspired when she saw my outfit. What is it with our obsession with France? We all know that French women have a certain je ne sais quoi when it comes to dressing, but I am not sure that wearing things that scream "I love France" quite captures that style of dressing, even though I am guilty of it. However, it's fun to play the American in Paris once in a while. My latest French acquisition was this tee from the J. Crew Factory. 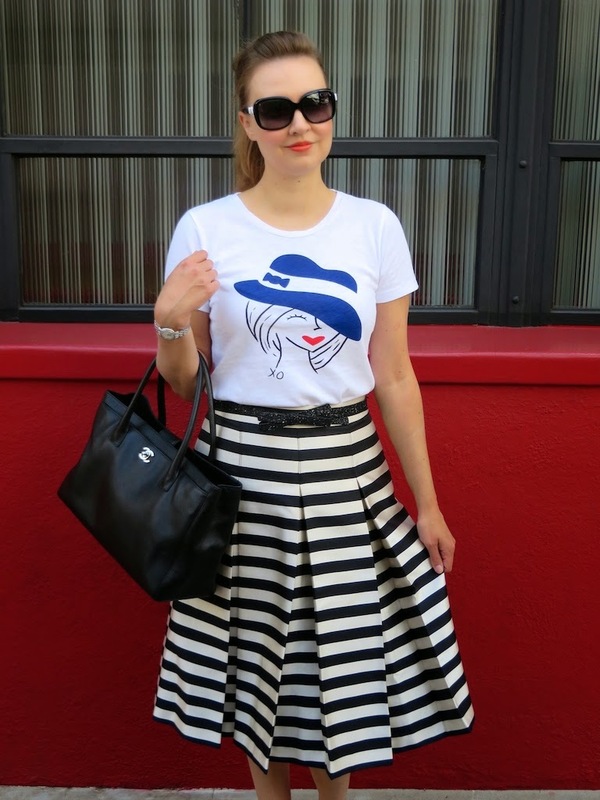 It's called the "Parisian Lady" collector tee. I paired it with this fun striped skirt which I picked up for a steal from Nordstom and of course some Chanel accessories because nothing screams Paris more than Coco herself. Ooh yes...I love the whole Parisian look as well. This skirt is so, so fantastic!! Thanks Ashley! I think this skirt is going to quickly become one of my new favorites! This outfit with that bag.. just gorgeous! Thanks Laura! I hope you're having a great week! Hello Gorgeous. You are a Fancy Francophile indeed. That T-Shirt is super cute and I am in love with the flats and skirt. Oh-La-La Chic!! Thanks Ada! I totally fell in love with this tee when I first spied it in the store. You definitely can't go wrong with red,white and black! It's a classic! Thanks for stopping by! That top is so cute and I love how you styled it here! I agree it is very Parisian! Thanks! The colors of this tee makes it really fun to style with so many different things. Thanks for stopping by Nicole! Love the shoes! I saw the pump version of that and sooo wanted to buy it. Just the right amount of cute, yet classy. Thanks! I am kicking myself because I didn't buy them in red when I had the chance. I would get these in every color I could get my hands on because they are so comfy! Thanks for stopping by Yvonne! Thank Angela! These are quickly becoming my favorite fall shoes! Oh wow - love everything about this look! 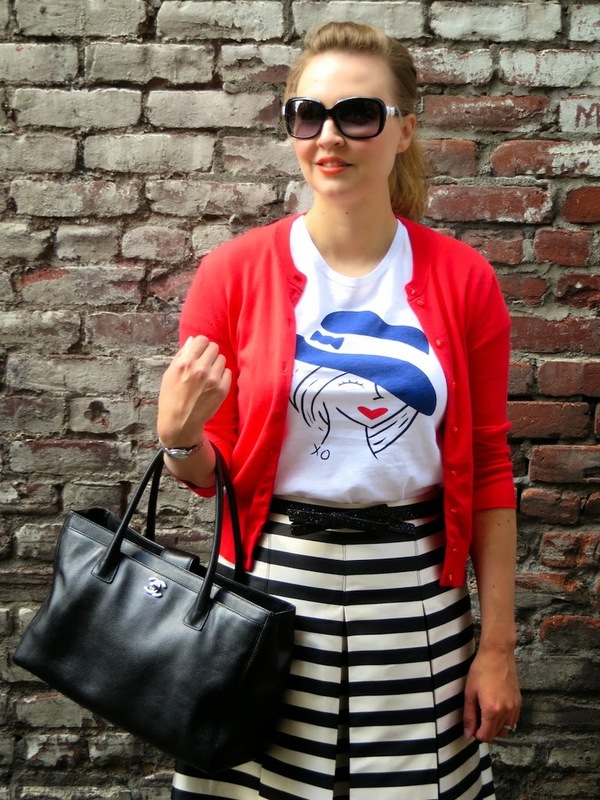 That tee is just too cute and looks wonderful with the stripes and pop of red! Thank you! 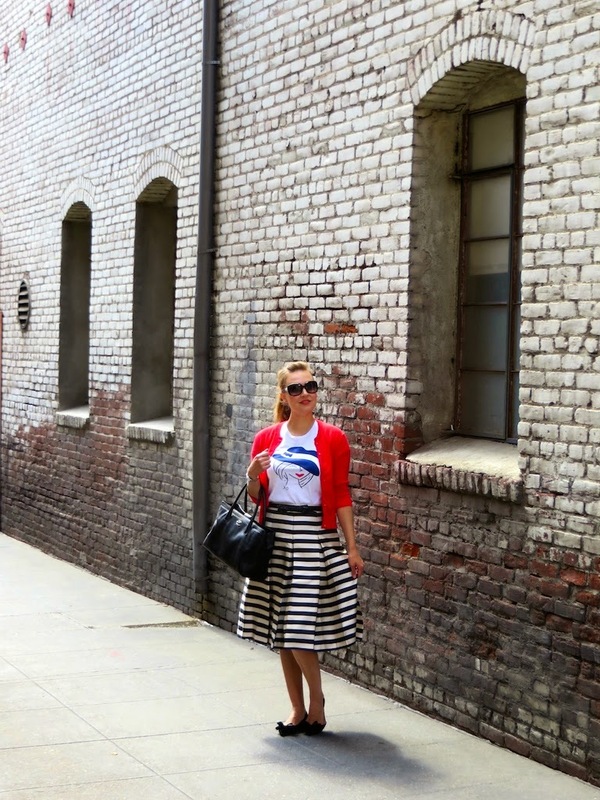 I think this look has all of my favorites too: bows, stripes and a touch of the Parisian!